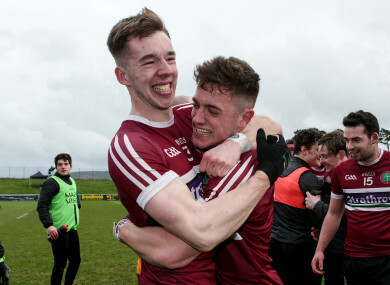 St. Mary's Caolan Dillon and Liam Rafferty celebrate after full-time. DEFENDING SIGERSON CUP champions UCD exited at the hands of St Mary’s on Saturday afternoon, with the Belfast side coming out on top by three points in their semi-final meeting in Mallow. The opening half went very much the way of St Mary’s, winners of the Sigerson Cup in 2017. After what was generally a tight start to proceedings, it was St Mary’s that edged into the lead with the opening score of the game on the 10 minute mark. Stephen McConville converted with an effort from a free. That would not be the end of his scoring contribution in the opening half, as he would score three more points, including two of those from frees. UCD were finding it difficult to break down what was an organized St Mary’s defence in the opening half, while they also were playing against what was a strong breeze. St Mary’s got a number of fine scores from distance in the opening half of play. Jarleth Og Burns let fly and converted with a fine score, as did Liam Rafferty from all of 45 yards out. Things were very much going the way of the Belfast college and they led 0-7 to 0-0 at the half time break. UCD’s first score of the day came in the 36th minute through a point by Barry Dan O’Sullivan. Despite their best efforts, St Mary’s were to keep in front and book their place in the Sigerson decider against UCC or NUIG. Scorers for St Mary’s: Stephen McConville(4f) 0-6, Ryan Coleman 0-2, Jarleth OgBurns, Liam Rafferty,0-1 each. Scorers for UCD: Evan O’Carroll(2f) 0-4, Barry Dan O’Sullivan, Darragh Kennedy , Peter Healy, Cian O’Connor 0-1 each. 18- Conor McAllister (Derry) for Boyle (48). 19. Gary Walsh (Laois) for Meyler (21)(b/c). 23. Brian O’Seaachain (Kerry) for McGinn (44). 18. Darragh Kennedy (Cavan) for Fortune (47). Email “Star-studded UCD bow out of Sigerson Cup as St Mary's triumph over defending champions”. Feedback on “Star-studded UCD bow out of Sigerson Cup as St Mary's triumph over defending champions”.